Teams unveil their cars on April 26 in the Ford Motor Company Engineering Design Center's atrium. Students test out the Baja car at the April 26 unveiling. Team adviser Michael Beltran (left) takes a look at the Baja car. Undergraduate dean Wesley Burghardt mingles with students at the April 26 unveiling. The Formula team gets its car ready for its grand entrance at the unveiling ceremony. Julio M. Ottino, dean of Northwestern Engineering, talks with members of the Formula team. With newly redesigned cars, Northwestern’s Baja and Formula SAE (Society of Automotive Engineers) teams are gearing up to speed past the competition. Both teams will race in three competitions this quarter. The Baja team will head to Baja SAE Kansas, an international competition in Pittsburg, Kansas, from May 25 to 28. The Formula team will race May 10 to 15 at FSAE on the Michigan International Speedway and again June 21 to 25 at Formula SAE Lincoln in Lincoln, Nebraska. 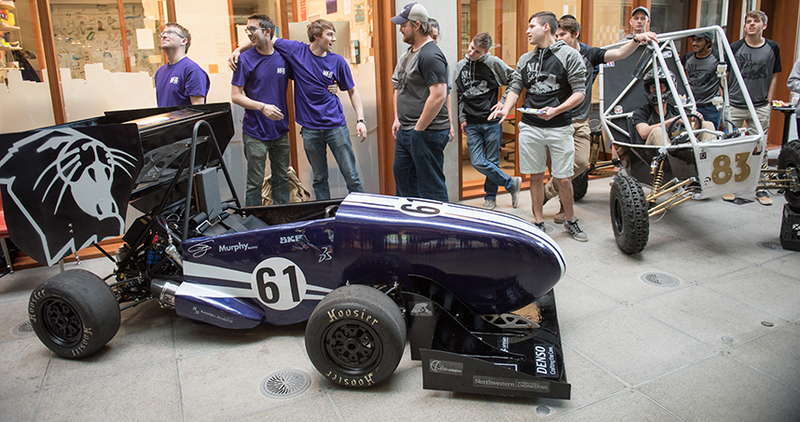 Northwestern’s SAE teams give students hands-on experience in the entire research, design, and manufacturing process. Not only do students gain engineering experience, they also learn about the business, marketing, and outreach skills required to raise funds, stay in budget, and promote their projects. To help students design and build their cars, the Segal Design Institute provides significant resources, equipment, and mentorship — adjunct associate professor Dan Brown supports both teams. Instructor and lecturer Michael Beltran advises the Formula team, and Oluwaseyi Balogun, associate professor of civil and environmental engineering and mechanical engineering, advises the Baja team. With Northwestern’s Wildcat painted on its rear wing, the Formula car’s design is hard to miss. But it has more than just a pretty paint job. Since last year, the Formula team either upgraded or completely redesigned every system on the car to make it even faster and more aerodynamic. The team redesigned the car’s intake and exhaust system, for example, to give it a 10 percent boost in power. The Baja crew also optimized and improved different elements of its car. Built for off-roading, Baja cars navigate through rough terrain, such as snow, mud, and rocks, and they compete in dynamic events, which include hill climbs, rock crawls, and maneuverability challenges. Although it will eventually be covered in dirt and mud, the Baja car currently sports a white and gold body, which students crafted for the first time from a single sleek carbon fiber panel. In some other firsts, the team also manufactured a carbon fiber seat, switched from air shocks to coil-over shocks, and generally optimized the car’s rear packaging. Although Baja’s project manager Sarah Gorlick (mechanical engineering ’17) appreciates the hands-on engineering experience that comes with building a car, she most loves the people.